Fr. Dr. V. Y. Dasappan S. J. Language and Literature and 77% for Latin as Second Language from the University of Calicut, Kozhikode. (1989-’92)..
Master’s Degree (M. A) with a First Class and First Rank in English Language and Literature from Loyola College, Chennai affiliated to the University of Madras. (1992-’94). Bachelor’s Degree in Philosophy from Jnanadeepa Vidyapeeth, Pune. (1996-’98). Bachelor’s Degree in Theology from Jnanadeepa Vidyapeeth, Pune. (2000-2003). Ph. D in English and Latin Poetry from the University of Madras. The Degree was awarded in September 2015. Attended one Orientation Course and two Refresher Courses,each programme of one month duration in interdisciplinary subjects, sponsored by the UGC and held at the Academic Staff College, Kariavattom, Thiruvananthapuram. Successfully completed a basic level certificate course in Latin language and Literature heldfrom June 1986 to March 1988 and an advanced level course in Latin Language and Literature from June 1989 to March 1992, both held at Christ Hall Jesuit Training College, Malaparamba, Kozhikode. Successfully completed the four weeks’ course of training in Counselling and Spiritual Direction held at Socio-Religious Centre, Malaparamba, Kozhikode. Successfully completed a Graduate Course in Classical Latin at Campion Hall, University of Oxford, UK held from 22 February to 17 May 2008 in the Hilary and Trinity Terms of the University. Professor of Latin at St. Xavier’s College, Thumba, Thiruvananthapuram since December 1994. Jesuit Priest since January 2004. “Visudha Francis Xavier: Swapna Theerangale Pinthudarnna Sanchari” (Malayalam article). Sathya Deepam. Book No: 76, Issue No: 17, December 2002, pages 5, 12. “Jeevanmukthanaaya Christu: Swamy Vivekananda” (Malayalam article). Bharatham Kanda Christhu ed. Thomas Panikulam S. J. Kottayam: Jeevan Books, 2005. Edited a book titled Latin Language and World Cultures published by Media House, Delhi, 2013. Reprint of the same book in 2015. “Latin Language and World Cultures” in Latin Language and World Cultures.ed. Dasappan V. Y. Delhi: Media House, 2013. “Hopkins and the Ignatian Vision of World and Art”. Vidyajyoti Journal of Theological Reflection.Vol 78, No. 3, March 2014, 42-53. “The Call of G. M. Hopkins as Priest and Poet”. Asian Journal of Religious Studies. JDV, Pune, May 2016. “Charged with the Grandeur of God: Poetry of Eco-Spirituality” published in TJES (Teresian Journal of English Studies) by Dept. of English, St. Teresa’s College, Ernakulam. ISSN 0975 – 6302. October 2016. Vol. 8, No. 1. Pages 56-64. “Dazzled by a Star in the Dark: G. M. Hopkins’ Agony in the Garden” published in Indian Journal of Postcolonial Literatures by Dept. of English, Newman College, Thodupuzha. ISSN 0974-7370. Vol. 16. 2 (December 2016). Pages 5–14. “The Winter and Warm: The Ascetic and Aesthetic Strains in Gerard Manley Hopkins” published in LPC Bulletin on Research (A Refereed Multi-Disciplinary Research Journal) by Lekshmi Research Cell, Lekshmipuram College of Arts and Science, Neyyoor, Tamilnadu. ISSN 2249-3417. Vol. 7. Issue 2 (January 2017) pages 112-117. Principal-in-Charge of St. Xavier’s College, Thumba from 5 July to 17 July 2015. Vice-principal of St. Xavier’s College, Thumba, Thiruvananthapuram from April 2005 to March 2009 and from June 2015 to April 2016. 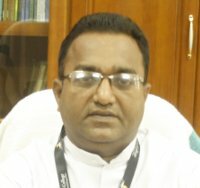 Principal, St. Xavier’s College, Thumba, Thiruvananthapuram since 30 April 2016. National Service Scheme (NSS) Programme Officer from June 2003 to March 2010. Secretary of the College Co-Operative Society from June 2006 to March 2012. Caretaker of NCC (Army) from April 2009 to March 2011. General Co-Ordinator of UGC sponsored Add-On Courses from June 2006 to March 2008, from June 2009 to March 2013 and from June 2015 to April 2016. Member of the Board of Studies for French and Latin of the University of Kerala since October 1998 till date. Member of the Faculty of Arts, University of Kerala from January 2005 to October 2010. Member of the Curriculum Sub-Committee of Higher Secondary Education of the Government of Kerala from September 2004 till date. Co-Ordinator of cultural activities in St. Xavier’s College, Thumba from April 2004 to March 2012. Member of Commission for Sexual Harassment against women in St. Xavier’s College, Thumba from April 2007 to March 2012. Director of Xavier Outreach Services (XOS) from June 2003 to May 2007 and from June 2008 to May 2013. Assistant Parish Priest of Assumption Parish church, Marianad from March 2003 to March 2005. Parish Priest of Fathima Matha Parish church, Fathimapuram from March 2010 to May 2013. Director, St. Xavier’s College Alumni Association, since January 2016. Attended the National Seminar on “Education since Independence” organized by the Dept. of Education, University of Kerala on 12th and 13th Nov. 1998 at the University Senate Hall, Thiruvananthapuram. Participated in the International Symposium on Science-Religion Dialogue and Cosmic Future on January 2-6, 2006 at Avion Holiday Resort, Lonavala, Maharashtra organized by Indian Institute of Science and Religion in Collaboration with Tilak Maharashtra Vidyapeeth, Pune. Chief organizer of the National Seminar on “The Impact of Globalization on the Fishing Community in Kerala” jointly organized by Xavier Outreach Services and the Dept. of Economics of St.Xavier’s College, Thumba on 12th and 13th October 2009 at St. Xavier’s College, Thumba, Thiruvananthapuram. Chief organizer of the International Conference on “Latin Language and World Cultures” held on March 11 and 12, 2010 at Hassan Marikar Hall, Thiruvananthapuram jointly organized by the Dept. of Latin of St. Xavier’s College, Thumba and the Institute of English of the University of Kerala, Thiruvananthapuram. Chaired a session on “The Popularity and Credibility of New Media” at the two-day UGC sponsored National Seminar organized by the Dept. of Malayalam and Mass Communication of St. Xavier’s College, Thumba held on 9 and 10 October 2014. Participated in Conferences and scholarly discussions at the Department of English of the University of Oregon, Eugene, Oregon, USA from October 1 to November 1, 2013.